Thanksgiving is usually a time of year that I don't give very much thanks. It's not that I'm not thankful but I just don't have the time. I'm so busy with work I barely have time to eat. In fact, yesterday, All I had for twelve hours before dinner was a single croissant. While it was good I was ready for dinner when I arrived at home. As is a Thanksgiving tradition I did nothing but get home, slump down, and wait for dinner to be ready. It's the one meal a I have absolutely nothing to do with. Jen's father had arrived a few hours earlier and was a little grumpy about the fact that Jen had set him up to watch a Harry Potter movie. I guess he was not feeling the magic of J.K. Rowling. 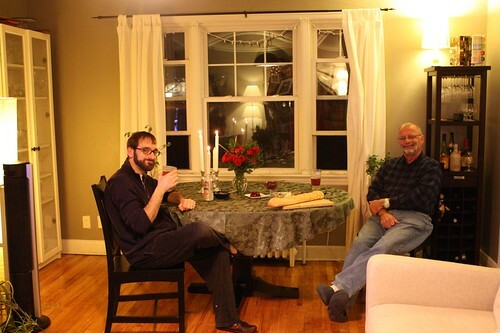 Since Jen's father was here (a now bi-annual tradition) he helped keep me company and polish off a jar of pickled herring before the main course while Jen slaved away in the kitchen. I think we would both feel more guilty about supporting gender stereotypes this way if it weren't for the fact that both of us cook dinner just about every night between the two of us. 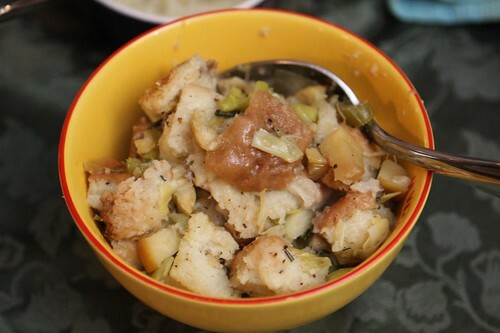 One of the items on this year's menu was the stuffing that Jen made with roasted chestnuts and leeks. The one part I had in this meal was in helping Jen decide between getting whole chestnuts and roasting them or getting them already prepared. Against my advice she decided to get them whole. She has been a bit suspicious of chestnuts ever since she made a granola with them and we both learned a valuable lesson: never make granola with chestnuts. It starts off quite nice but since they are not actually nuts they slowly dry out over time until you end up with a granola that basically has small granola-colored rocks in it which will break all of your teeth. If you learn nothing else from reading this blog, learn this: never make granola with chestnuts. Never make granola with chestnuts. 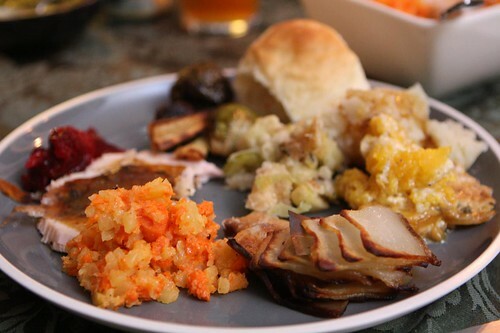 Jen's complete meal featured: roast turkey, gravy, mashed carrots and turnips, domino potatoes, mashed potatoes, cranberry jelly, cranberry sauce, scalloped butternut, chestnut leek stuffing, roasted Brussels sprouts and parsnips, and Jen's sweet rolls. Like most years there were three or four additional dishes that Jen had planned but just didn't end up getting around to. Most people would probably agree that ten items for three people is plenty. And what beer did we have with this meal? 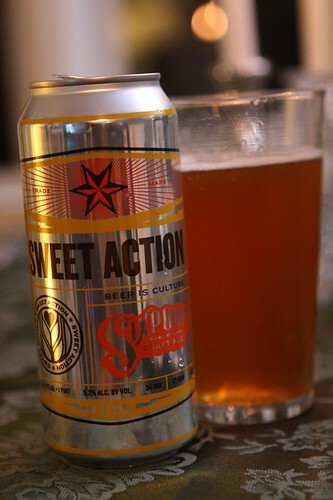 Sweet Action from Sixpoint in Brooklyn, New York. I wanted to introduce Jen's father to a new beer local to our area. I also picked this because they come in sixteen ounce cans which is something that I figured would be a comfort to my father-in-law. After some of Jen's best pumpkin pie to date we lounged around and foolishly had some coffee. Then I slept about two hours because I never have coffee later than 1:00 PM. Not my finest hour. Oh, yeah! I almost forgot! Never make granola with chestnuts!